CHICAGO (AP) — Welington Castillo said everything he wanted to say with one big swing. 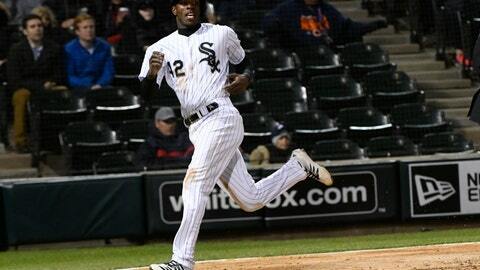 Castillo atoned for an error with a two-run homer in the eighth inning, and the Chicago White Sox rallied to beat the Kansas City Royals 5-4 on Monday night. Castillo’s poor throw on Billy Hamilton’s steal in the seventh helped set up Whit Merrifield’s tiebreaking sacrifice fly. But Castillo came up big after Tim Anderson led off the eighth with a double against Brad Boxberger (0-3), sending an opposite-field drive to right. “Great moment for him and even better moment for the team,” Anderson said. It was Castillo’s first homer since he was suspended last May for 80 games by Major League Baseball following a positive test for a performance-enhancing substance. He was just 2 for 27 before his first extra-base hit of the season. “The guys just kept chipping away,” Renteria said. Dozier put Kansas City in front when he drove Santana’s first pitch of the second over the wall in center for his fourth homer. After Ryan O’Hearn flied out, Lucas Duda worked the first of his three walks and Owings connected for his first homer of the season, giving the Royals a 3-0 lead. “If the ball was hit just a little bit harder, we would have turned the double play and got (Fillmyer) out of that inning, and he might have been able to continue to roll,” Royals manager Ned Yost said.